usually comes as an afterthought when designing a loft conversion. Due to the nature of a non unified sloping ceiling, manufacturers don't make a screen to suit off the shelf. 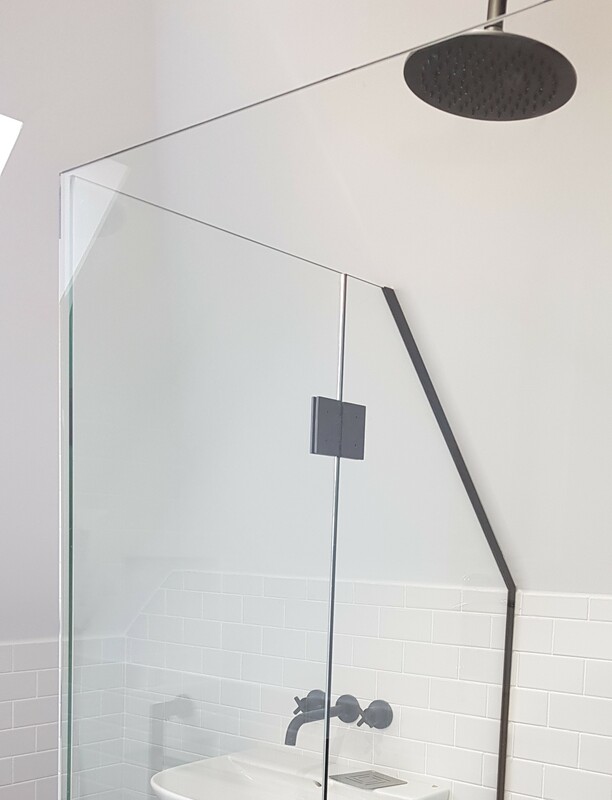 We can fulfil your requirements exactly and provide you with any shaped bespoke glass to make up a full enclosure or a simple stand alone panel or anything that might sit under the loft eaves. We have an easy to understand template that you can measure from, fill out and email back to us. We can then provide a free CAD/Drawing that will confirm the shape and size of the area/ opening that you have readied for your shower screen or enclosure. More importantly, we have done this many times for may customers so the common mistakes that most make when designing and manufacturing glass, we can see errors way before any glass is placed on the cutting table. Our design service is free and there is no obligation to move forward with us if you change your mind. The CAD drawings we provide allow a clear costing and its easy for us to provide a free quotation and also for you to see clearly what you will get if you decide to purchase from us..